Motorola didn't make a big deal of it, but the Droid X's lack of physical keyboard could be its biggest distinction from the original Droid smartphone. 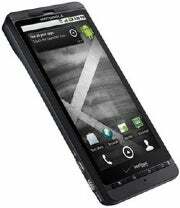 It's obvious why Motorola would drop the sliding keyboard from the Droid X: The phone's 4.3-inch screen adds enough bulk already, and tacking on a keyboard would've turned the Droid X into an unwieldy tank. Still, the move signals a shift away from physical keyboards in smartphones, one that's been a long time coming. Arguably, Apple started this trend with the iPhone in 2007. Not everyone was sold on the touch screen keyboard. PCWorld listed the lack of keys as one of the iPhone's "gotchas," and research firm User Centric tried to empirically measure the virtual keyboard's lack of usefulness. My PCWorld colleague Tim Moynihan prayed that touch screen keyboards would not be the future of smartphones. The original Motorola Droid featured a physical keyboard. Unfortunately for Tim, they are. Rare is the high-end smartphone that attempts the physical keyboard - Blackberry phones excluded, but we'll get to that in a moment -- and the ones that tried have failed. The Palm Pre, hyped in part because of its vertically-sliding keyboard, lost points in PC World's review because the hardware felt flimsy. The original Droid also got pre-release props for including a slide-out keyboard, only to lose favor because its flat keys were difficult to use. As for Blackberry phones, indeed the physical keyboard is still a strong lure, but wait a minute: According to Nielsen, Research in Motion's keyboard-free Blackberry Storm was the seventh-most popular phone series in the United States last year, and the second-most popular Blackberry series. Not everyone associates Blackberry with the Curve's screen on top, keyboard below aesthetic. Looking ahead, more smartphone makers will opt for a touch screen that runs the length of the phone, without the bulk of a sliding keyboard behind it. Look at Windows Phone 7, for example. Although Microsoft will allow for phones with physical keyboards, it's telling that the prototypes Microsoft demonstrated to the press in February used virtual keys instead. It's just better to have a full touch screen with no bulky, sliding parts. I won't go so far to say that in some murky, distant future, you won't find a single smartphone that has no physical keyboard. After all, the flip phone fell out of favor long ago, and you can still find those with any wireless carrier. But in terms of popular use, the physical keyboard is dying, and Droid X is helping arrange the funeral.